The Stow-Away Guitar | OhGizmo! From what I’ve seen most guitar cases out there are actually filled with machine guns, rocket launchers and other assorted weaponry leaving the guitars to fend for themselves. 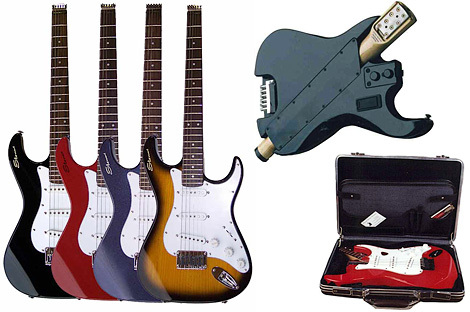 The Stewart Guitar Company is clearly aware of this problem and so have designed a guitar that can fit inside something as small as a briefcase, which are usually readily available. The standard Stow-AwayTM model features traditional styling with a double cut-away, solid alder wood body, three single coil pickups mounted in a 3-ply white pickguard, a headless 25 & 1/2″ scale maple neck with rosewood fingerboard, 22 medium frets, Graph Tech saddles, and a linear tuning system. The Stow-Away Guitar is available for purchase on the Stewart Guitar Company website and runs from $499.95 to $699.95 depending on the model you choose.